This beautiful town on the Atlantic coast is a wonderfully welcoming community, to those on both two and four legs. In this edition of the Doggy Bagger, we’ll explore our picks among the many dog friendly restaurants in St. Augustine, FL. But before we hit the eateries, let’s explore a little. Your pooch is going to love dog friendly St. Augustine! First off, if you’re staying over, check Petswelcome for pet friendly lodgings in St. Augustine. It’s a lovely beachside town, and your pup is welcome on all the beaches except for Anastasia State Park; just keep your canine on leash, and be sure to clean up after him. 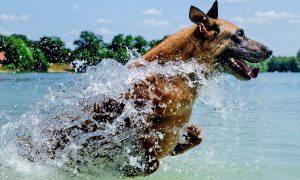 If you want a spot where he can run off leash, try Paws Dog Park at Treaty Park, which features dedicated areas for large and small dogs with watering holes, shaded areas, and even a mock fire hydrant. There is also the Paw Park that is part of the Ron Parker Park on Anastasia Island. It has areas for small and large dogs, water features, shaded areas for sitting and play, and plenty of tennis balls. Your pup is also welcome (on leash) at the Ponce de Leon’s Fountain of Youth Archeological Park. Stroll and enjoy the view from the Founders Riverwalk, which extends out into the Matanzas River, or any of the historical reenactments that are always going on at the park. There are so many dog friendly restaurants to choose from in St. Augustine. We’ll start with those that have the added bonus of giving you a wonderful water view. Harry’s Seafood Bar & Grille is located in historic downtown St. Augustine. You and your best friend are welcome at their patio seating, which looks out over the bay. The menu has a distinctive mix of Cajun and Southern, with offerings like Shrimp & Grits, Blackened Red Fish, Boudin Balls, Grouper Fingers, Jambalaya, and their own creations, like Louisiana Fondeaux, a warm cheesy dip made with shrimp and crawfish, and Bacon-Wrapped Scallops, served atop mini corn cakes and drizzled with a tasso ham cream sauce. Finish the meal up in style with your choice of Bananas Foster, Pecan Pie, Key Lime Pie, or Oreo Beignets (oh yeah, you know you want them!). O.C. White’s Seafood & Spirits is just down the street from Harry’s, on the south side of the Bridge of Lions, located in a building that dates back to 1790 and was one of St. Augustine’s first hotels. 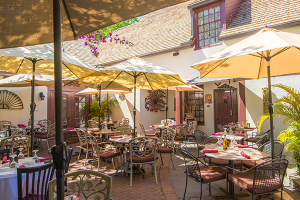 You and your pooch can dine together on their beautiful patio, shaded by umbrellas and palm trees. Lots of crab, shrimp, and fish on the menu, which makes us very happy, particularly the crab—Crab Spinach Dip, Crab-Gouda Stuffed Portobello Mushroom, Crab Legs, Blue Crab Cakes, and Crabby Local Catch, the catch of the day topped with fresh crabmeat and a sherry cream sauce. While the afternoon away with your pup at Creekside’s dog friendly waterside seating! 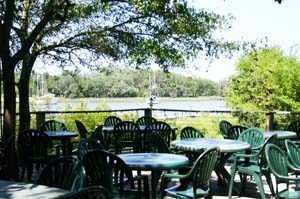 Creekside Dinery gets you out of the hustle and bustle of downtown St. Augustine and sets you down on their pet friendly patio alongside the bucolic Gonzales Creek, surrounded by magnolia and oak trees. They do love their shrimp there—pan sautéed, beer battered, stuffed with grits, scampi, blackened, coconut. For appetizers, try the Smoked Fish Dip, Crab Bisque, or, if you’re feeling brave, their Oysters or Shrimp St. Johns. It’s served with melted cheese, bacon, and Datil Jumpstart Sauce—it case you’re not a chilehead, the datil (which calls St. Augustine its home) clocks in at 100,000 to 300,000 Scoville units worth of hotness, giving the habanero a run for its money. 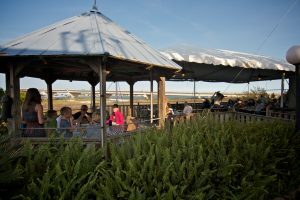 Kingfish Grill is located down at the docks on Camachee Cove Yacht Harbor, offering dog friendly seating on the lawn and on their shaded decks. They’ve got their own version of raw bar, with oysters on the half shell, as well as sushi and sashimi. Look for soft shell crab on the menu—topped with lemon aioli in a sandwich or topped with garlic herb butter as an appetizer. Other noteworthy apps include Camachee Crab Cakes topped with datil pepper jelly, Conch Fritters, and Fried Gator Tail, served with a sweet chili orange sauce. For mains, we love the Captain’s Platter, with fried shrimp, oysters, and scallops, plus a piece of mahi-mahi, served with fries and slaw, as well as the Kingfish Low Country Boil—a savory, spicy mix of shrimp, scallops, mussels, snow crab, potatoes, corn, and andouille. Enjoy the tasty menu of The Raintree with your canine! 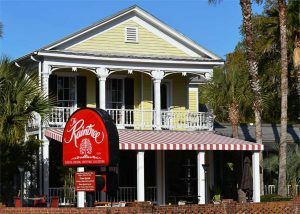 We love The Raintree, located in a charming house built in 1879. The menu is fusion plus, a crazy cross of Southern, Italian, steakhouse, and God knows what—and who cares, when it tastes good?! Appetizers include Lobster and Sweet Pepper Bisque, Ahi Tuna Carpaccio, and Bacon & Blue Cheese French Fries. Choose from pastas like Grilled Shrimp & Housemade Sausage with Marinara & Sweet Pepper Aioli and Jumbo Shrimp & Lobster Pasta with Champagne Butter Sauce; or the Catch of the day with a Mornay Sauce, or with Lemon Garlic Butter, or a Balsamic Reduction; or mains like Veal San Marco (topped with shrimp, mushrooms, and lobster-infused sherry butter sauce), Raintree Seafood Thermidor, or Filet Mignon Bearnaise. La Pentola has a beautiful dog friendly patio. When you’ve kind of had enough of seafood, come to La Pentola. (Although, yes, they do also have seafood! We like it best in their pastas—particularly their Lobster Ravioli.) Try the Veal Osso Buco, Chicken Lombardi (with spinach, artichokes, sun-dried tomatoes, and lump crabmeat), or Veal Piccata. If you go for lunch, definitely try the Duck & Goat Cheese Salad or Roasted Beef Tenderloin Sandwich with Horseradish-Jalapeno Cream Sauce. Enjoy it all with your best friend at one of the tables at their dog friendly patio seating.